The White Grizzly experience is one created by forethought, dedication to the craft, connection to the natural surroundings, inspiration via many essences, precise attention to detail, years of improvement on technique and training. White Grizzly is the Art of Cat Skiing. 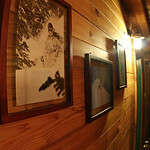 In March of 2012, Carole and Brad hosted Winter Dreams, a five-day event that launched the incorporation of live-art into the White Grizzly Cat Skiing experience for those who desire it. Each day, an artist in residence went out on the mountain with the group, and the artist’s current works were on display at the Lodge and available for purchase. 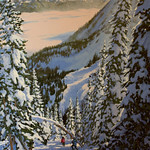 Guests may even commission particular scenes or portraits on the mountain. 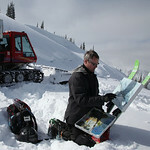 The current artist, Jean-François Racine, is a Quebec-born painter who combines his passion for skiing and painting into lifelike mountain scenes. He has extensive experience working with people in live settings; he has painted on the slopes of winter resorts around the country. 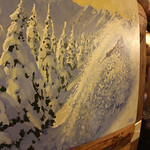 His art revels in the beauty of nature, and conveys the joy many Canadian find in winter. He is most renowned for his ability to capture vivid patterns of light and colour, and his works can be found in many Canadian galleries and museums. Jean-François Racine's website. White Grizzly is proud to host artists, photographers, videographers, cinematographers, sculpters to help celebrate winter and the majesty of Canadian mountains through art. 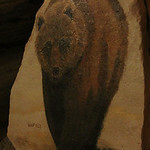 You can have your journey at White Grizzly immortalized, simply contact the office to make arrangements. It just never stopped puking for 48 hours straight. 37 cm over night, 22 when we arrived. Snowed 25 today. All at -4, -5. Deepest pow of my life. Trofts. Beautiful as it can get in the mountains. Thanks forever!